"A costume featured in the tenth Star Trek feature film “Nemesis”. 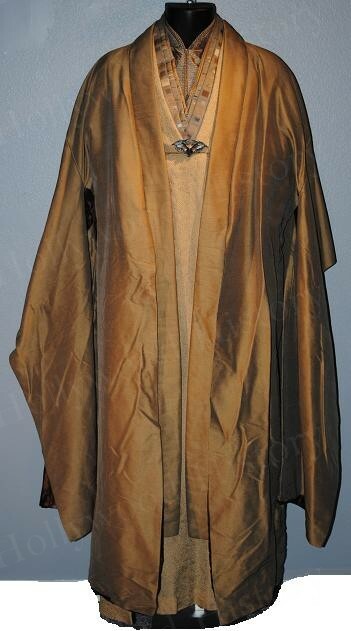 These are the robes of a member of the Romulan Star Empire Senate, it is composed of a gorgeous gold under robe with long sleeves that zip to fit at the cuff, have a slit up the legs, and features interior collars to appear more flush in the same multi-colored square style as the Romulan fleet uniforms from the same movie. The outer robe is made of a subdued gold fabric featuring thin, black, pinstripes, a metallic-copper interior lining with elbow length, kimono-inspired bell-sleeves, and an open front that has matching tassels sewn on. All of this goes over a sage-colored dickie with white dots that ties up the back and features a Mandarin style collar. This costume includes a dark-gray, resin cast, pin-backed Romulan senator’s badge." I think this is a good price on an outstanding costume. If you don't have one, they display beautifully and I love mine. 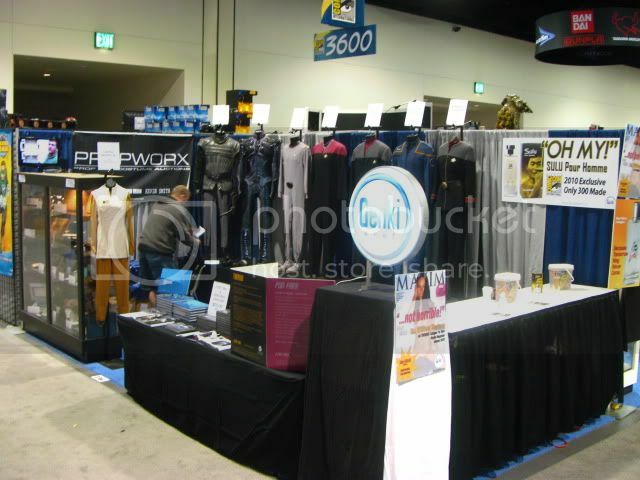 I hope you all will stop by the Propworx booth if you are at the San Diego Comic Con! 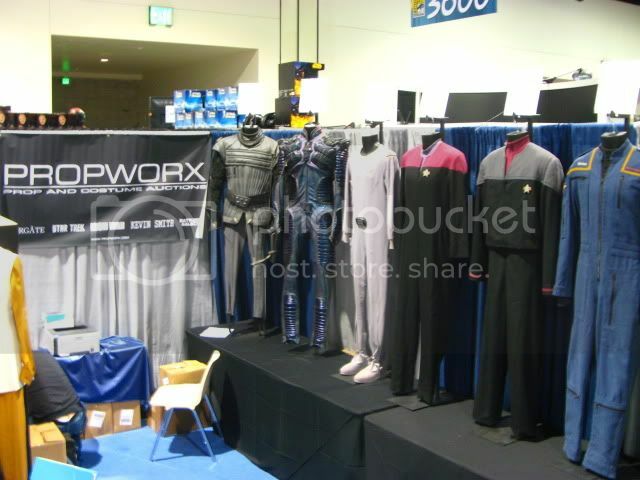 We have a great display with costumes of all 5 captains, the Klingon and Reman costumes that will be in the Propworx Star Trek auction, as well as a bunch of other great items from the auction. We are booth # 3744. Kirk hits $ 37,500 at Heritage auction! Well, I have to say, I am not taking my buddy Jack Morrissey to any more Star Trek auctions with me as he is a VERY bad influence. My top bid on the Maroon Star Trek 2: The Wrath of Khan costume was supposed to be $ 25,000. But Jack convinced me, moments before the auction started, that I should bid even higher because of various financial reasons that would work to my benefit. I mean, what are friends for? And what is sad, is that my high bid of $ 35,000 was a LOSER! Yes, I am the guy who kept bidding on the Kirk after my $ 25,000 max was reached. The eventual winner and I were the only two bidders from $ 25-37,500. And he won. And thank God, because if I had won at my max bid on $ 35,000 I would have HATED myself! This is also a good lesson in auction market dynamics. Now remember, the Christie's Kirk Maroon went for $ 25,000 ($ 30,000 after Buyer's premium I believe). Does this mean the market price for a Kirk is now $ 37,500 ( or $ 45,000, the price with Buyer's Premium)? Well, no, because there are only two people who thought it was worth $ 35,000 or more, and one now has it in his collection. If another goes up for auction, the loser (me) will probably have his heads screwed on tighter (and leave his enabling friend at home) and won't go above $ 25,000. So unless a third person decided to go higher, the price will come down. But it all depends. How bad does someone want one? After I lost, I went over and shook the winner's hand. I didn't know who he was. He later came over and introduced himself. He knew me from my blog, and turned out to be one of the oldest prop & costume collectors around. A very nice guy, we chatted for over 30 minutes and exchanged info so we can see each other's collections. He even admitted that if he had known me before the auction he would have backed off as his max was only $ 15,000! It is funny how emotion can affect one's bidding. Below are the photos and description from Heritage so we can preserve it for posterity. Star Trek Film Series Starfleet Officer's Uniform with Jacket and Shirt Worn by William Shatner as Admiral James T. Kirk. One of the most accomplished and popular feature films to come out of the Star Trek franchise, The Wrath of Khan (1982) was also the first to feature the distinctive scarlet and black duty uniforms that subsequently appeared throughout the original film series as well as several episodes of the various TV spin-offs. When Gene Roddenberry created the original series in the '60s, he gave Starfleet a basic military structure but avoided what he called "excessive militarism," keeping such details to a minimum. During production on The Wrath of Khan, director Nicholas Meyer (The Seven-Per-Cent Solution, Star Trek VI: The Undiscovered Country) decided to expand this part of the Trek mythos by writing the dialogue to be more accurate to actual naval protocol and adding such flourishes as a ship's bell and boatswain's whistle, and by introducing redesigned uniforms by costume designer Robert Fletcher. This particular costume Starfleet duty uniform features a jacket and undershirt worn by none other than William Shatner in his role as Admiral James T. Kirk, and later modified and worn by Leon Russom, along with the included trousers, as the Starfleet Commander-in-Chief in Star Trek VI. The uniform consists of the distinctive maroon jacket, sleeveless white undershirt, black trousers, and black leather belt with metal Starfleet insignia buckle included. 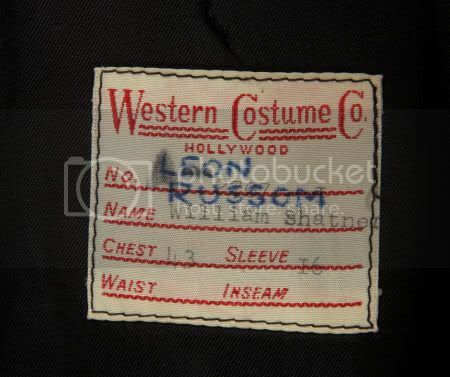 The jacket features a Western Costume Co. tag with Shatner's name typed onto it and Russom's name handwritten on it in black felt tip; the slacks have a Paramount Studios tag bearing Russom's name in felt tip sewn into the waistband. 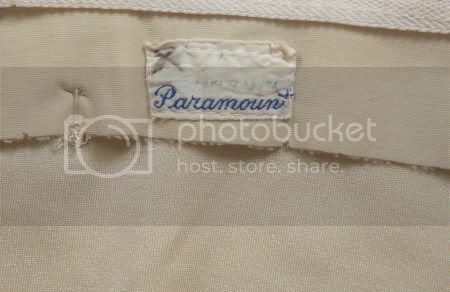 The uniform is in overall Excellent condition with the exception of a small hole on the front of the jacket where an insignia pin was attached. Accompanied by a COA from The Hollywood Studio Collection. Photo-match for reference purposes only. For authenticity guaranty see Terms and Conditions. 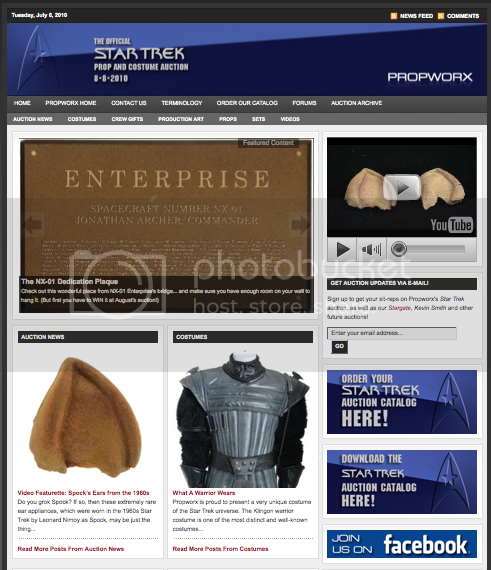 Propworx Star Trek website launches! The Propworx Star Trek auction is only a month away and so Propworx superstars Joe Beaudoin, Jarrod Hunt and Damaris Degen have put together the Official Star Trek Auction website on the Propworx.com site. 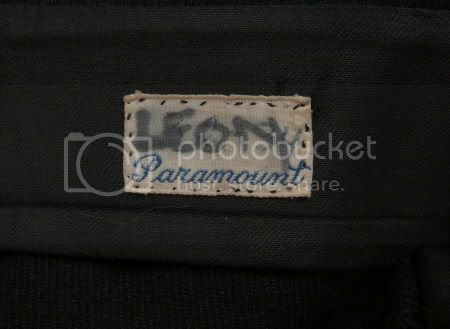 There are blogs on the props, costumes, set pieces in the auction as well as the crew gifts from the Mike and Denise Okuda collection.